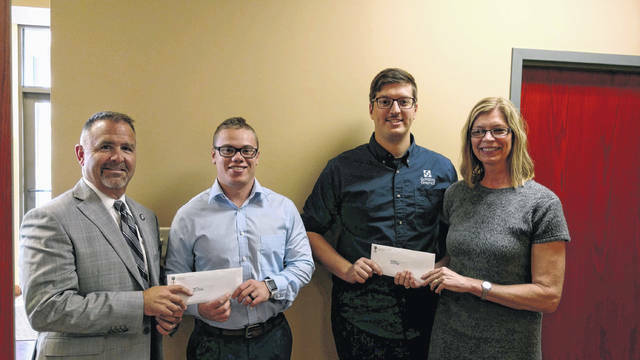 BUCYRUS — The Community Foundation for Crawford County offers a unique scholarship program designed to attract college graduates from Crawford County to return home to live and work. Recently the Foundation joined with First Federal Community Bank to present the first installments on those awards. Foundation President Lisa Workman and First Federal Community Bank President Brad Murtiff presented checks to Rowan Kempf and Gage Roe. These awards are used toward paying off college debt. In return, the recipients must move back to Crawford County to live and work. Kempf is a graduate of Galion High School and Bowling Green State University, where he earned a bachelor’s degree in visual communication technology. He is currently employed as a digital marketing assistant at Schilling Graphics in Galion. Gage graduated from Wynford High School and the Raj Soin College of Business at Wright State University, earning a B.S. in Economics. He is currently employed at Ohio Mutual Insurance Group in Bucyrus as an associate claim representative. Workman explained that the requirements for these awards include: completion of an associate, undergraduate, graduate, or skilled trade program within the last seven years; proof of student debt; and proof of employment or an entrepreneurial venture in Crawford County within 120 days from the time of selection. Applicants may not be already living in Crawford County at the time of their application. Awards will be $10,000 paid in quarterly increments over two years. There is no deadline to apply, as the process will be ongoing. “It’s especially exciting that both Rowan and Gage did internships at their current employers,” said Workman. Murtiff serves on the Foundation’s Board and the Come Home Scholarship selection committee. Workman serves on the Crawford Partnership Board. The two organizations are both working to enhance the quality of life in Crawford County.